Learning to swim is the best way to stay safe in, on and around the water. One of the most popular ways to beat the summer heat is to visit the local water park and fly down the water slide or tube along the lazy river. To help make sure your trip to the park is fun, the American Red Cross has some safety steps you should follow. 1. Learn to swim. It’s the best way to stay safe in, on and around the water. If you cannot perform the five steps of water competency in order, find a Red Cross swim class. 2. Make sure lifeguards are on duty before you go in the water and follow all their instructions. 3. Wear protective clothing, including a hat and some kind of cover-up for when you’ve had enough sun. 4. Use sunscreen before leaving home and reapply during the day. 6. Drink plenty of fluids – avoid drinks with sweeteners or caffeine. 7. Parents – keep an eye on the kids. If they can’t swim or are less than four feet tall, have them wear a U.S. Coast Guard approved life jacket. 8. Read the attraction signs and listen to all instructions given to you by the lifeguards. Obey the rules. Follow age and height requirements. 9. 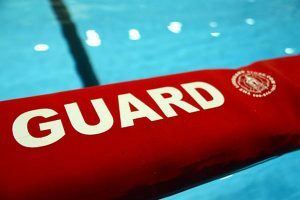 Signal a lifeguard if you see someone is in trouble. Yell if you need to grab attention, but don’t go in after the person yourself. 10. Set up a meeting place in case someone gets separated from your group. Use the buddy system to make sure no child is alone. 11. Watch the weather and get out of the water at the first sign of lightning or the rumble of thunder. Stay indoors and away from water for 30 minutes after the last lightning flashes or thunder roars. DOWNLOAD FREE APPS TO PROTECT YOU. Our Emergency App allows you to choose weather alerts, such as thunderstorms, for areas where you are near the water. It will also give you real-time information on how to keep safe for that particular alert. Our Swim App allows you to access water safety and drowning prevention information and track your child’s progress in Red Cross swim lessons. Children will enjoy learning water safety tips with child-friendly videos and quizzes. Download both apps from your app store by searching for American Red Cross or by going to redcross.org/apps.